Since C-U Blogfidential is not even close to being high enough up the food chain to be thrown promotional scraps (e.g., invitations to preview screenings, canned interviews, exclusive photos, etc.) 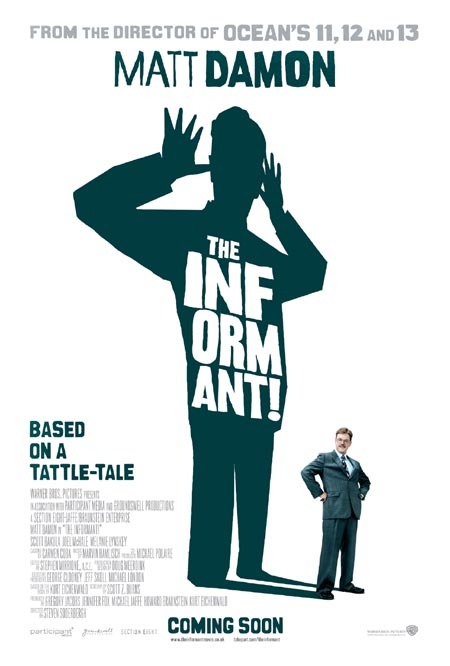 by Warner Bros., we have to be a bit creative in how we cover THE INFORMANT! Our headline doesn’t pertain to an in-depth book-to-screen comparison or an imagined Mark Whitacre/Matt Damon face-off or even a chart cross-referencing the non-parallels between this INFORMANT! and the 1997 Hallmark television movie THE INFORMANT starring Timothy Dalton. That is, unless one counts the line of dialogue spoken by Damon as Whitacre about being like an agent “double-oh-fourteen” because he’s twice as smart as a certain fictional super spy, but we digress. Instead, while scouring the Internet for INFORMANT! related details, we discovered an alternate poster for the film (see below) which we presumed was just a “B” design meant to attract one’s attention if the “A” poster (see item: 9/7/09) didn’t do the trick. Your humble editor certainly prefers “B” over “A,” if for no other reason than its stylized type face and graphics recall Hollywood marketing in the Fifties for topical dramas such as THE MAN WITH THE GOLDEN ARM (1954), BLACKBOARD JUNGLE (1955), SWEET SMELL OF SUCCESS (1957), and the previously mentioned A FACE IN THE CROWD (1957). The aesthetic choice is somewhat anachronistic, given the film’s comedic tone and contemporary setting, but it looks cool nonetheless. Luckily, someone across the pond elected to use the “B” style for the United Kingdom release on November 20, carried over to this Web site which simply looks nicer than its U.S. counterpart. Warner Bros. noticeably updated both last weekend on the eve of the Venice and Toronto play dates for THE INFORMANT! Fun items to look for include streaming cuts from Marvin Hamlisch’s offbeat music score and an extensive photo gallery on the U.S. site along with a downloadable PDF of production notes from the UK site. One can also zip through the IMDb.com photo gallery, which seems to include images not available on either the U.S. or UK sites, along with their expansive credits listing so you can find out which of your friends and neighbors were connected well enough to work on the show. This entry was posted on Sunday, September 13th, 2009 at 1:09 am	and is filed under Gone Hollywood. You can follow any responses to this entry through the RSS 2.0 feed. Both comments and pings are currently closed.